Master Seo,a former Korean National Taekwondo athlete,is the owner and head trainer at Golden Dragon Taekwondo. The Golden Dragon Demonstration Team will showcase a variety of taekwondo techniques on the Guthrie Green lawn as part of this year’s Global BASH. 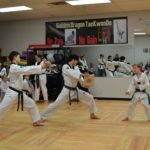 Master Seo’s athletes will also be available to answer questions and talk to kids and adults interested in learning more about this martial art.